What's new in Cascade 8? Cascade content management system (CMS) allows you to edit your website wherever you happen to be. Your navigation is generated for you, your links managed and your content accessible. 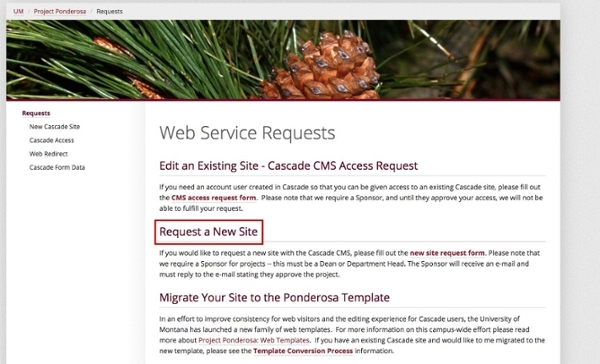 Cascade empowers you to update and publish without a middleman between you and your website. Best of all, Cascade requires no software to install and can be used anywhere--at work, home or on the road--provided you have access to the internet and a web browser. I need to get access to Cascade and request a new website, where can I do so? Go to the Web Homepage and click on the red “Request Assistance” button halfway down the page. On the “Web Service Request” page, click the “Request a New Site” link. Login with your NetID, fill out the form and click the “Send” button at the bottom of the page. Watch the Web & Documents Training video, answer the questions below the video and click the “send” button. The Web Team will email you when your new site is ready. I’m working on a website, but I only want access to one part of the site. Is this possible? The Web Team provides access and permissions within Cascade on a site-by-site basis. Users will have access to view, edit and publish assets within an entire site. How do I get access to my Form Builder submissions? To request access to form data, you can fill out the Cascade Form Data Request Form. How can I get access to edit my department’s study page? Once a year, in the late spring, Study Pages open up for a period of time to be edited by people within their department. We will notify you when that period has opened. After that period of time is passed, Study Pages are locked from editing until the next year. If you have any questions about this, you can reach us at webhelp@mso.umt.edu or (406) 243-4361. Can I receive training in Cascade? The Web Team offers Cascade trainings the first Friday of every month in the morning (this schedule may change in the summer). For more information about these trainings or to register, check out the Web Homepage and scroll down to the “Upcoming Web Short Courses” section. Can the Web Team make my website for me? The Web Team is consistently working to improve the University of Montana’s web presence, however, we don’t have the capacity to provide custom content or to build individual websites. We would be happy to answer any questions you may have regarding your website. We can be reached at (406) 243-4361 or at webhelp@mso.umt.edu. Does the Web Team have any kind of Cascade documentation or “How To” manual on using Cascade? If you’d like further information about how to use Cascade, all of our documentation can be found by exploring the top navigation of this page (the bar with tabs across the top of the page). More information on our Template and updates can be found at the Web Homepage. What’s the difference between the Setup Block and the Section Block? Setup Blocks contain lots of information about sites in Cascade, including the name of the Site, what content appears on Homepages, as well a host of other information that helps Cascade make your site. The Setup Block is mainly concerned with the homepage of your site and site-wide information such as the site title. For more information on the Setup Block and how to utilize it, visit the Setup Block Documentation. The Section Block is concerned with folder-wide content additions. It can add a banner to the top of every page in a folder. This can be a color bar or a banner image. The Section Block can also add a sidebar to every page in a folder. The Section Block will affect every page in the folder that the Section Block is placed in. Additionally, if you’d like the Section Block to target specific pages rather than the entire folder, you can do this within the “Advanced” area of the “Edit” section. For more information about the Section Block and how to utilize it, visit the Section Block Documentation. I want my featured image to be a cycle slideshow. Is this possible? The Ponderosa Template does not currently support cycle slideshows within featured or banner images. This is due to web accessibility standards and research showing that slideshows are an ineffective way to provide content to users. Does the university have a set of colors I should be using in my website? Yes. Many of our features, like the Button Plugin for example, include a drop-down menu of UM-approved colors to choose from. For more information about UM Brand Colors, check out the Brand Guidelines-University Colors Page. When I add a word to my dictionary in the Spellchecker, does it only affect me or does it add it to everyone's dictionary? The dictionary in the spellchecker is per user, system wide. This means that adding a word to your dictionary will only affect your dictionary, and no one else's. It also means that it will affect your dictionary across the entire system, so no matter what page you are editing, you'll be using the same dictionary with your spellcheck. For more information, check out our Spellchecker Documentation. I'm trying to edit a page and it says the page is locked from editing! Help! With new keyboard shortcuts, it is much easier now to accidentally lock a page from editing. If you run into a page that has been locked by someone else, call the Web Team at 406-243-4361 or email us at Webhelp@mso.umt.edu with a description of exactly what page you're trying to edit. We can override the lock and unlock it for you! My page still isn’t showing up in my navigation, even though I published the parent folder. Why isn’t it appearing in my navigation? Ensure that you have given the page a Display Name. A missing Display Name could cause an asset to be missing from the navigation structure. To add a Display Name, select the asset and click “Edit”, the Display Name box will be near the top of the page. Ensure that the page is set to be included in the navigation. To do this, select the page, click “edit” and make sure “Include in Navigation?” is set to “Yes”. If your page still isn't’t showing up, ensure that the page or folder is set to be included in indexing and publishing. For a page, this can be viewed by selecting the page, clicking edit, clicking the "Configure" tab, and then ensuring that the “Include when indexing” and “Include when publishing” boxes are checked. For a folder, this can be viewed by selecting the folder, clicking edit, going to the "Properties" tab and the ensuring that the “Include when indexing” and “Include when publishing” boxes are checked. How do I reorder my navigation structure? To reorder items in your navigation, select the folder that contains the desired assets. Click on the “order” tab above the folder’s contents. Once you’ve selected “Order”, the items will display in ascending order (smallest to largest). Navigation ordering is based on this ascending order, that is “1” will be the first link in the navigation structure. For Top Navigation, “1” is the leftmost link and for Left Navigation, “1” is the topmost link. 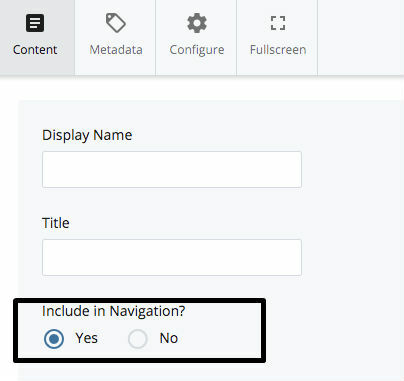 You do not have to click “Submit” to save your changes, but you will have to publish the parent folder in order for the new navigation order to appear on your site. For more information on Navigation, check out our Navigation Documentation. I made a new page but no matter how many times I publish, it won’t show up! It takes two minutes for updated content to show up after clicking publish, so wait two minutes and check again. If the new page still isn't’t showing up after two minutes, ensure that you are publishing the parent folder, not just the page. The parent folder is the Cascade folder that contains the page. 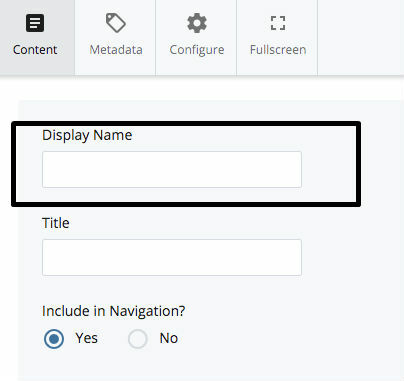 By publishing the parent folder, the newly updated folder that now contains your new page will be published, meaning that your new page will now be included in the navigation of the folder and now will be accessible to users. If you receive an error message that states “Asset it not set to publish. Please enable publishing for this asset and try again.” when you try to publish the page, you need to change the settings so that the page is set to be included with publishing. For a page, this can be changed by selecting the page, clicking edit, clicking the configure tab, and then ensuring that the “Include when publishing” box is checked. For a folder, this can be checked by opening the folder, clicking edit, clicking the "properties" tab and the ensuring that the “Include when publishing” box is checked. Why aren’t my stories publishing? If you’ve created a new Story or edited an existing Story, publish the entire Stories Folder. If you have edited the Config Block, publish the default page on which your Stories display. When in doubt, publish both the Stories folder and the default page on which they display. How do I reorder my stories? To reorder your stories, go to the stories folder, click on the “order” tab above the folder’s contents twice so that the assets display in descending order (largest to smallest). Once you’ve selected “Order”, the items will display the correct order and you can drag stories around to reorder them by hovering to the right of the asset name until the cursor turns into a double ended arrow. Note that in the Stories order, the highest number is the leftmost story. The lower the number, the more further right the Story will appear. You do not have to click “Submit” to save your changes, but you will have to publish the Stories folder to reflect the changes made. What’s the difference between Tiles and Stories? Stories are the new and improved Tiles. Everything that you liked about Tiles is maintained within Stories, with enhanced functionality. You can easily reorder Stories, set your Stories to be automatically generated from social media accounts, categorize Stories by type, archive Stories, and feature specific Stories. All these new features were added with the launch of Stories and are not available through Tiles. If you’re still using Tiles, we can assist you in making the transition to Stories. You can reach us at webhelp@mso.umt.edu or (406) 243-4361. Why do some websites seem to have a more customized appearance than others? We have built the Ponderosa Template with the ability for people with HTML/CSS coding skills to add upon or embellish the template. Additionally, some sites, such as the Davidson Honors College and many of the College of Humanities and Sciences sites have been designed and supported by Spectral Fusion Designs, a web design team on campus that builds upon the Ponderosa Template. If you have specific questions or design goals, we’re happy to meet with you to discuss them. You can reach us at webhelp@mso.umt.edu or (406) 243-4361. How can I see which parts of my site have the most user traffic? Information regarding analyzing your user traffic and top content can be found on the Analyze Your Results page of our website, where Cascade users can access Google Analytics reports. How do I get a custom URL to point to an existing page on my website? If you’d like a redirect to an existing page in your website, you can submit a Web Redirect Request. Can I copy components from the UM homepage into my website? The UM homepage is using a template that is completely one-of-a-kind and that is separate from the Ponderosa Template, which is what your website is using. So, unfortunately you are not able to copy parts of the homepage into your website. There are many aspects that you can use within the Ponderosa Template that are similar to what you see on the homepage, but they appear differently in the Ponderosa Template. Why does Cascade look different? On August 9th, we upgraded to a new version of Cascade, Cascade 8. We have heavily documented how to use Cascade 8. You can browse through the documentation by clicking through the top navigation on this page. To see past emails that we sent to all Cascade users regarding the upgrade, check out our Past Communications Page. What are the biggest differences in Cascade 8? You can check out our What's New in Cascade 8? page to learn more.